The remake was great all right. A great mistake. If you really believe that was great I understand why vampire movies now include sparkles or vampires that are nothing more than zombies. 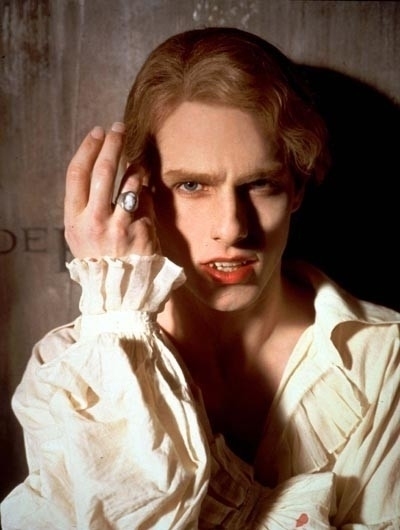 Vampires that could be complex, seductive, tragic, yet predatory are lost because of movie goers like you. You should be ashamed of yourself. Charley Brewster (Anton Yelchin) is finally the cool kid at school, and it’s ridiculous how popular he is. He’s dating the hottest girl in school, the he’s in with the popular crowd, his nerdy childhood friend Ed (Christopher Mintz-Plasse) is fading into obscurity… But none of that matters now that he’s found out his new neighbor is a vampire. After a series of murders in the area, it’s getting harder and harder for Charley to ignore what’s happening right next door. What Charlie’s next move is might be anyone’s guess but he’ll have to do something if he doesn’t want to end up his neighbor’s next meal. I honestly didn’t want to like this movie. As a longtime fan of the original, I just didn’t care to see a movie that didn’t need a remake. But about a week before it came out, I started getting excited about it and after seeing it, loved it. I’ve always been a big fan of Horror/Comedy and this came together just the way I like it. In fact, if I had to compare my own Zombie story’s tone to a currently existing film, I’d have to say this fits it pretty closely. Anton Yelchin comes off as a pretty regular kid to me who wants to escape his previous life as a comic-book nerd. I don’t relate c0mpletely, but I do understand to a point. He’s a jerk, but not to the point of being unlikable. While speaking of people good in their roles, every single casting choice in this film is good, even Mintz-Plasse, who I thought I’d be sick of after the Superbad (2007) obsession. He seems to have a found that geeky niche that he may never get away from, yet at the same time, make it work in a role that is unlike anything else he’s ever liable to play. I don’t see him ever trying to murder his former best friend after becoming a supernatural creature of the night in Role Models 2 (Note: Role Models 2 not actually coming out…as far as I know.) In fact, something I see that didn’t make sense to me in the original but fits now is why Ed is trying to kill Charley at all. In the first one, he just becomes bad. In this, he might be bad, but Charley has also been a condescending jerk. Imogen Poots, which is a really weird name to me (along with the fact that her middle name is “Gay”) plays Charley’s girlfriend, and I don’t know; she’s just likable. If I’d had my choice for Gwen Stacy in the upcoming Spiderman movie, it probably would’ve been her. 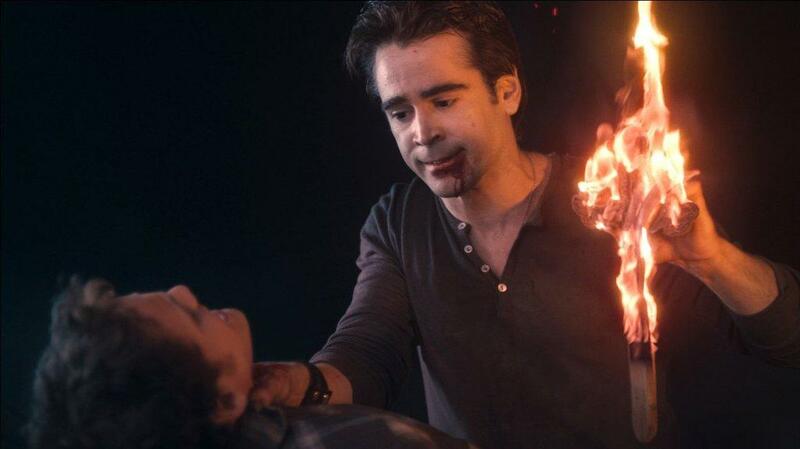 …And now back to Colin Farrell. If you read my In Bruges article a couple weeks ago, you’ll know I’m a fan of Colin Farrell’s choice in movies these days. I can’t get vampire elitists out of my head as I type this, but he plays this role well. Weird little ticks and smooth, seemingly unnecessary movements came off to me as a man who’s not really a man, but an animal disguised as a man with bizarrely acute senses who’s constantly surveying his surroundings. His ability as a craftsman is an interesting character choice in that his lifespan would allow to learn those skills over time, only to make him an expert in disposing of bodies, even if it means hiding them until they turn into his own private army. Much of what I want to say for this overview would involve me ultimately giving credit to the original; including the fact that while movies that normally have the out-of-their-league protagonist defeat the well-equipped villain just makes the villain seem less threatening. But they do a good job here in that Jerry the vampire is just so sure of himself, he just can’t imagine the boy next door being any real threat. Something else that stuck out of course, is David Tennant, as Peter Vincent. This guy is perfect as the cheauvanistic, celebrity magician. Roddy MacDowall was perfect of course, but a change in pace is fine for a contemporary update. His scenes are some of the best in the movie by far. Any trip into his character’s high-rise gives us a good feel of his arrogant ways, as well as his true nature of involvement in the supernatural, which leads in smoothly to a Las Vegas magician being able to actually assist in the death of a vampire. Or at least try. I also dig the soundtrack. Then there’s the camerawork: Everytime they showcased the broad horizon, the bright lights, and city in background, I couldn’t help but think the filmmakers were having us keep in mind what’s ultimately at stake, as personal as the story is. There are bigger things at stake than just Charley and his little life, and simple shots like this help give the story a larger scope. Lastly, I loved the look of Jerry transformed. It was just pure evil and I was wondering how they were going to show it, but when he reveals himself from underneath the van, skin pale, multiple, jagged rows of teeth and unrecognizable as human, that was when I was thinking to myself, “This is how a remake should be done if it’s going to be done at all. But…where are all the doilies? ?”(The second sentence, never actually thought). This entry was posted on 04/06/2012 at 4:14 am and is filed under You've Gotta See This with tags anton yelchin, colin farrell, fright night, remake, vampire, zombies ruin everything. You can follow any responses to this entry through the RSS 2.0 feed. You can leave a response, or trackback from your own site.